The other vacation we have found is only 3 nights long, but also all inclusive. If you book this one, yuo would have to pay $839 per person and you would stay at Sugar Bay Resort and Spa on St. Thomas. So, which one do you like best? Do not waste too much time on thinking, these offers might not be here for long! 4 nights hotel stay at The Pyramid at Grand Oasis, all inclusive service, a round-trip flight from Houston to Cancun and taxes are all included in the Cancun vacation package featured above. 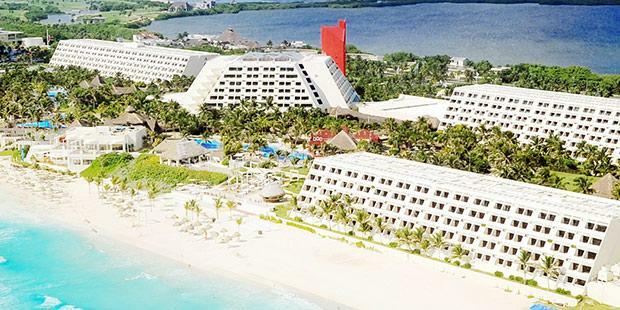 The Pyramid at Grand Oasis is a 4 star hotel right on the beachfront of Cancun that offers full all inclusive service. This means that you will get meals and drinks while you stay there as well as get access to all the facilities and activities of the resort. If you book this offer now, you can save as much as $400 on the regular price of the package. In just a minute or so you can find other Cancun vacation packages as well that might suit your travel plans better. Or you can just reassure yourself that you were booking the best offer on the market. Add your travel details, pick the merchants you like and compare.